The book was good and useful tool. Gave good background into the Trinity and covered some aspects i have not thought about. My reason for purchasing this book was because I have friends who are Jehovah's Witnesses and I needed a guide to help me understand and explain the truth of the Trinity. I am finding this book very helpful in that respect. Tim Chester has extended the boundaries with this one. It is a masterful effort on his part to get to grips with the difficult subject of the Trinity. It is full of wonderful depths and splendid heights and makes the reader explore the Godhead in a way that leads to worship. The Trinity is a subject which most Christians have little understanding of and yet it is at the heart of our faith. I have found getting good material on the Trinity has been very difficult, especially material which is accessible and not academic. So Delighting in the Trinity by Tim Chester is a great find. 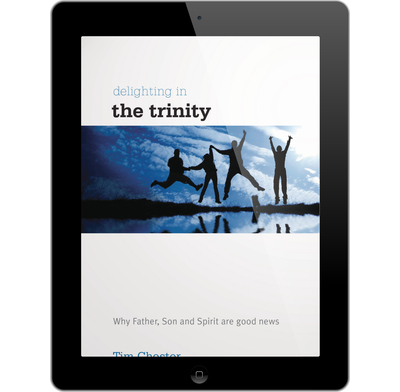 Chester sets out the Biblical case for the Trinity in a clear and easy to understand way. He then goes on to look at the historical developments of our understanding of the Trinity including the division between Eastern and Western churches over how to understand the Trinity. He also explains how the two traditions were brought together in the Protestant Reformation. If this sounds like it would be dry and boring then don't worry because Tim Chester has written it in an engaging manner and doesn't get bogged down in too much detail. The chapters are short and very accessible. Of course this means that you wouldn't write a dissertation based on Delighting in the Trinity but at no point did I feel like he had skimped either (although I'm not in a position to know if he did as I'm not a history expert). This is a book definitely for the majority of the church to read and not just theology students. Chester finishes with the practical implications of the Trinity. What does it mean for revelation, salvation, humanity, and mission. I found this very useful and I couldn't help but feel that a lot of the misconceptions or issues in the church today would be helped by us having a better understanding of our God. This is a book I would add to the church library and would lend/give to other people. The only comparable resources I have found so far are three talks on the Trinity by UCCF's Mike Reeves on Theology Network. I would say the talks and this book complement each other well. Tim Chester has written a very good book which shows that far from the Trinity being an issue for Theologians it is a wonderful truth the entire church should know. I do not really have any criticisms to make of the book and instead recommend that people get a copy for themselves and read it. Hopefully this book will help Christians to be less embarrassed or confused by the Trinity and instead feel confident in saying that God is Father, Son and Holy Spirit. m always eager to find good books in the hands of my church and to recommend them to others. Much is written on theological issues to advance the conversation between scholars and pastors. I love those books and they are important. We also need good books for those who are growing in their faith or joining the conversation on issues they need to learn, who are not always fluent in the lingo. I believe Delighting in the Trinity (DITT) will bring "delight" to all camps.